Though more than a Doc-in-the-box, I include this regulatory No Smoking or Vaping Allowed On Campus signage because of its specificity concerning smoking and vaping. But see no mention of smokeless tobacco, chew, or snuff. Also see that the no smoking icon is combined with the typography to save space yet communicate visually. 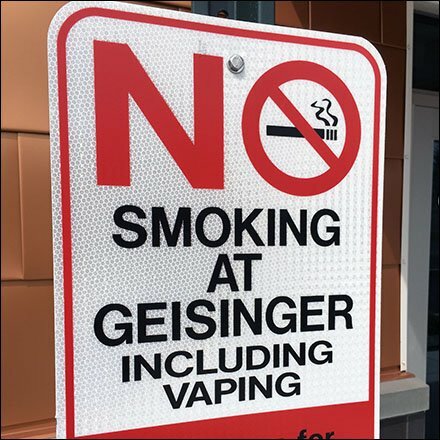 This No Smoking or Vaping Allowed On Campus seen at one of the many Geisinger facilities. Follow the links below for other approaches to regulation.